I’ve long thought that the way we build hones today is one of the least efficient methods of production that we have. Even on identical tract homes, it seems like every home is a custom job. Stacks of wood arrive, and out come the saw and hammers and the skilled workers squint at the blueprints and try to replicate the plan as best they can. And that’s just the framing. 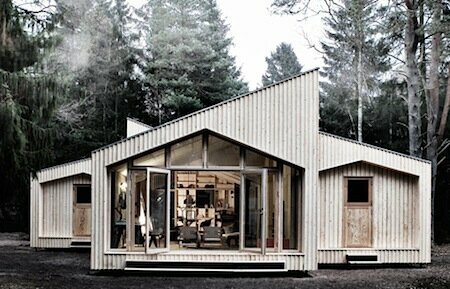 Denmark's first digitally fabricated housing. 800 sheets sustainable plywood is converted into 400 building components that together form a dwelling in the middle of the forest in Asserbo. Eventually, most low to mid level priced homes will be 3D printed. We’ve recently been having peeks at what’s coming, but we’re still a long way off. One interesting project can be found in a forest outside of Copenhagen Denmark. Danish architects Frederik Agdrup and Nicholas Bjorndal of Eentileen, in collaboration with Facit-homes.com, have “printed” a house, and the project is appropriately called the “Print a House” project. Technically, it’s not a 3D printed house. It’s a CNC’d house. A CNC is like a computerized milling machine that cuts the wood panels to the size they need, with all the cutouts where they are required. A CNC machine is a subtractive process, as opposed to 3D printing which is an additive process. This means that the CNC starts with a large piece of material, and then subtracts from it. But it’s still very cool, and we don’t have 3D printers big enough to pull off such large sections (yet). The first Print A House home they have built is Eentileen’s (named Named Villa Asserbo) and it’s 1.345 square feet. It was built with 820 sheets of plywood that were slotted and fitted together, without the use of any heavy machinery. The two completed the home in 4 weeks. The environmental impact is minimal. The wood is the only wall material used (other than windows), and it is PEFC certified from sustainable forests in Finland. Although the CNC process is subtractive, the computer-developed pieces were designed to waste as little wood as possible. And there is no concrete, and the structural steel is minimal. A Print A House can be easily and quickly constructed in almost any location or situation. And, since the home sits on it’s screw pile foundations, it can even be moved to a new location. Green. Efficient. Less expensive. Easily replicated. Portable. And this is just with CNC machines. Wait until we start actually printing entire homes.